A Distributed Denial‑of‑Service (DDoS) attack is an attempt to make a service, usually a website, unavailable by bombarding it with so much traffic from multiple machines that the server providing the service is no longer able to function correctly because of resource exhaustion. Typically, the attacker tries to saturate a system with so many connections and requests that it is no longer able to accept new traffic, or becomes so slow that it is effectively unusable. Application‑layer (Layer 7/HTTP) DDoS attacks are carried out by software programs (bots) that can be tailored to best exploit the vulnerabilities of specific systems. For example, for systems that don’t handle large numbers of concurrent connections well, merely opening a large number of connections and keeping them active by periodically sending a small amount of traffic can exhaust the system’s capacity for new connections. Other attacks can take the form of sending a large number of requests or very large requests. Because these attacks are carried out by bots rather than actual users, the attacker can easily open large numbers of connections and send large numbers of requests very rapidly. The traffic normally originates from a fixed set of IP addresses, belonging to the machines used to carry out the attack. As a result, each IP address is responsible for many more connections and requests than you would expect from a real user. Note: It’s important not to assume that this traffic pattern always represents a DDoS attack. The use of forward proxies can also create this pattern, because the forward proxy server’s IP address is used as the client address for requests from all the real clients it serves. However, the number of connections and requests from a forward proxy is typically much lower than in a DDoS attack. Because the traffic is generated by bots and is meant to overwhelm the server, the rate of traffic is much higher than a human user can generate. The User-Agent header is sometimes set to a non‑standard value. The Referer header is sometimes set to a value you can associate with the attack. NGINX and NGINX Plus have a number of features that – in conjunction with the characteristics of a DDoS attack mentioned above – can make them a valuable part of a DDoS attack mitigation solution. These features address a DDoS attack both by regulating the incoming traffic and by controlling the traffic as it is proxied to backend servers. NGINX is designed to be a “shock absorber” for your site or application. It has a non‑blocking, event‑driven architecture that copes with huge amounts of requests without a noticeable increase in resource utilization. New requests from the network do not interrupt NGINX from processing ongoing requests, which means that NGINX has capacity available to apply the techniques described below which protect your site or application from attack. More information about the underlying architecture is available at Inside NGINX: How We Designed for Performance & Scale. The limit_req_zone directive configures a shared memory zone called one to store the state of requests for the specified key, in this case the client IP address ($binary_remote_addr). The limit_req directive in the location block for /login.html references the shared memory zone. For a detailed discussion of rate limiting, see Rate Limiting with NGINX and NGINX Plus on our blog. The limit_conn_zone directive configures a shared memory zone called addr to store requests for the specified key, in this case (as in the previous example) the client IP address, $binary_remote_addr. The limit_conn directive in the location block for /store references the shared memory zone and sets a maximum of 10 connections from each client IP address. Here, the deny all directive blocks all client IP addresses that are not in the range specified by the allow directive. The updating parameter to the proxy_cache_use_stale directive tells NGINX that when it needs to fetch an update of a stale cached object, it should send just one request for the update, and continue to serve the stale object to clients who request it during the time it takes to receive the update from the backend server. When repeated requests for a certain file are part of an attack, this dramatically reduces the number of requests to the backend servers. The key defined by the proxy_cache_key directive usually consists of embedded variables (the default key, $scheme$proxy_host$request_uri, has three variables). If the value includes the $query_string variable, then an attack that sends random query strings can cause excessive caching. We recommend that you don’t include the $query_string variable in the key unless you have a particular reason to do so. Or if you discover that DDoS attack requests have a User-Agent header value of foo or bar, you can block those requests. The http_name variable references a request header, in the above example the User-Agent header. A similar approach can be used with other headers that have values that can be used to identify an attack. The max_conns parameter applied to each server specifies the maximum number of connections that NGINX Plus opens to it. The queue directive limits the number of requests queued when all the servers in the upstream group have reached their connection limit, and the timeout parameter specifies how long to retain a request in the queue. One method of attack is to send a Range header with a very large value, which can cause a buffer overflow. 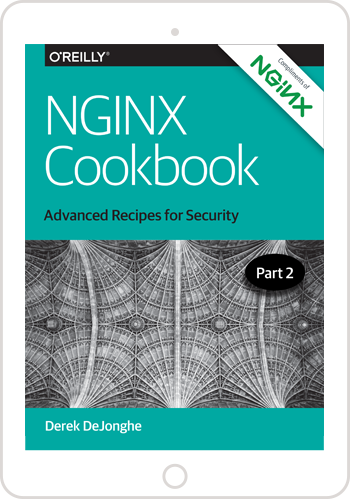 For an discussion of how to use NGINX and NGINX Plus to mitigate this type of attack in a sample case, see Using NGINX and NGINX Plus to Protect Against CVE‑2015‑1635. DDoS attacks usually result in a high traffic load. For tips on tuning NGINX or NGINX Plus and the operating system to allow the system to handle higher loads, see Tuning NGINX for Performance. So far we have focused on what you can use NGINX and NGINX Plus to help alleviate the effects of a DDoS attack. But how can NGINX or NGINX Plus help you spot a DDoS attack? The NGINX Plus Status module provides detailed metrics about the traffic that is being load balanced to backend servers, which you can use to spot unusual traffic patterns. NGINX Plus comes with a status dashboard web page that graphically depicts the current state of the NGINX Plus system (see the example at demo.nginx.com). The same metrics are also available through an API, which you can use to feed the metrics into custom or third‑party monitoring systems where you can do historical trend analysis to spot abnormal patterns and enable alerting. NGINX and NGINX Plus can be used as a valuable part of a DDoS mitigation solution, and NGINX Plus provides additional features for protecting against DDoS attacks and helping to identify when they are occurring. To try NGINX Plus, start your free 30‑day trial today or contact us for a live demo.